Equi-Heart Pledge: Day 2: Using the Magic Question to Transfrom Struggle! Day 2: Using the Magic Question to Transfrom Struggle! Last night a truly awful thing happened at the ranch. Or at least, what appeared to be an awful thing. My heart was in a knot. Until I tuned into the Healing Herd, who offered a brilliant way for me to transform my resisting, suffering attitude into peaceful acceptance! Is there something in your life that this question would magically transform? Please share! What was your Horse Wisdom Gem of the day today? Please comment and inspire others with the message of Horse! Ps. Want to read the true tale of how Charm (in today's video) helped me regain my power from fear and chronic fatigue? 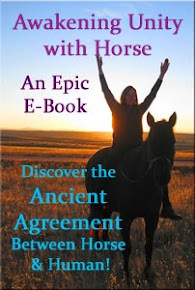 Plus use the tool of reclaiming your power with horse! 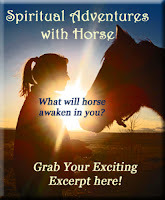 Grab your free empowering excerpt of Spiritual Adventures with Horse, at right. Don't forget your Equi-Pledge E-Workbook! I just printed mine out now so I can make the most of the gifts Horse is offering to me this month!